Almost all of our grandgirls have been visiting grandma's nursery since the day they were born. There is sweet lace hung at the window, and cabbage rose curtains which at times have come crashing down with great rambunctiousness. 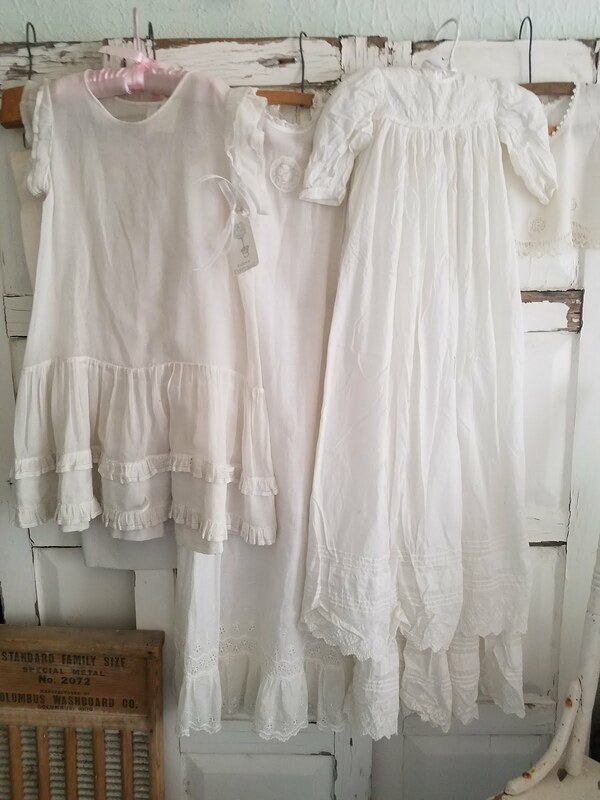 And there have always been little white dresses hanging about here too. So many of you left wonderful comments on my vintage dress and parasol post, and so when Marilyn of the blog Delights of the Heart asked if I had ever taken pictures of the girls in vintage clothes, I thought I would re-post a few from my early days on the blog. I have a long history of mixing joy and frills. My own daughter's blouse from a Laura Ashley pattern hangs next to last in the row here. And many other sweet frocks have found their way to loving homes from the Cabin & Cottage shop. But sometimes, before they go out the door, they have their day in the sun at a photo shoot or two. We have started a tradition of "Granny Camp", and sometimes it has been actual camping like this occasion in the mountains a few years ago when I brought a few props along for a photo shoot. Little girls love to dress up and pose for the camera, but I am always looking for more candid shots. I sometimes have to do some real talking or storytelling while I shoot to catch them all off guard. And of course I am only a picture taker! I have so much respect for the art of children's portrait photography. It has to be one of the most challenging jobs around! The pages of the old Victoria Magazine were full of nostalgic photos of girls in pretty dresses, and that was the mood I was going for. These three cousins have all just had their tenth birthdays. Emma and I celebrated age six on the patio for tea one summer in a pink dress that just recently sold in the shop. I'm also often asked about how I can bear to part with so many lovely things, but that's the life of a vintage Gramma! And maybe like the song says, "Love isn't love 'til you give it away!" Our dress up days have been a good time for brushing up on curls, and winding up pigtails as well as hearts together. And I think that vintage hearts are born young. Soon enough, a fragment from one summer day will pass on to other hands. I love a vintage life in which the soulful artifacts of the past can live on with new memories. One can either put things on display and wonder at the history, or one can add a page or two of one's own. Perhaps on one otherwise uneventful summer afternoon under a cherry tree. . . . I love capturing the girls in all their moods. These days little people have lots of opportunities for smiles into the camera. A thoughtful moment is much more rare. A girl and a popsicle and a little white dress. A simple beginning that can add up to so much more. . . Thanks for joining us on memory lane! I hope you're having a beautiful White Wednesday! It is grand opening weekend for Vintage Market & Design. Here are a few views of the shop to whet your appetite. . . . This is only a small sample of what you will find. Monday, Tuesday, & White Wednesday! It feels like an age since we were winding up for Easter, doesn't it? Or maybe it's just me. We were away for the long weekend, and I always like to get in a bit of digging around into new places. It makes me feel like I've been gone longer than I actually have. I thought I would bring you out onto the spring patio where the light is best and show off a few new thrilling finds. The "herbes" painted box is a local find from a great dealer who does a terrific job of dolling things up, but still manages to keep prices low. And the new ironstone pitcher was a find from my trip before last in Lubbock, TX. I discovered a wonderful newish shop in my daughter's town with a dealer that loves linens like I do. Finding this old cotton dress just made my day! Plain and simple, and no-frills beautiful. I just love the look of old garments hanging in a room. A different booth had this wonderful ruffled apron. The body and ties are a crisp organdy, but the waistband and ruffle are of a luscious soft handkerchief linen. The ticking stripe pillow underneath was another Lubbock find, and fits perfectly on my old French rush seat stool. Love the farmhouse vibe! The ruffled white Victorian parasol is the big star of the weekend (from the same shop). How can something so ragtag make you so happy!? But there truly is nothing quite like finding wonderful pieces of old. All silky, delicate, and water stained. . . .
Just look at those feminine curves! And now time for a wardrobe change! I don't know what the wonderful light woven checked fabric is called, do you? The back is even prettier than the front! The sailor collar of handkerchief linen comes to a gentle peak at the center. Cotton tape ties and tucks. (I just bought some of this at LaurieAnna's in Canton, TX. The cuffs are meant to be folded up and fastened with pretty cuff links. Now that my grandgirls are getting older, I'm passing on some of the smaller vintage things and stockpiling for the future. It's such a pleasure finding fine old things for them to dress up in. I hope you enjoyed having a look! Wishing you a wonderful White Wednesday! TIMEWASHED for Blissful Whites Wednesday!